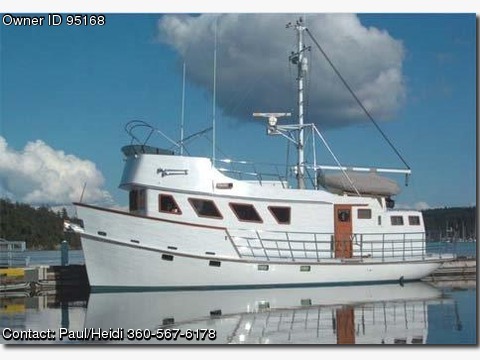 BOAT OWNER'S NOTES: Call Paul or Heidi 350-567-6178. For more information cut and paste this link into your web browser and visit: http://www.shipshapesystems.com/MaverickForSale.html Custom built Maverick is a yachting legend (featured in Passagemaker and Nor'Westing Magazine) and has proven to be an incredibly stout boat with a 1 1/2" solid hand laid fiberglass hull, She is an absolutely unique, cozy, classy and comfortable home with maximized systems, seaworthiness and cruising capabilities, Her 9.5 Sq Ft Trac Digital Active Fin Stabilizers make cruising wonderfully comfortable even in choppy or high swell seas. The flybridge and boat deck are thoughtfully configured, The upper helm is very far forward, protected by a Bimini top, Tweak the auto-pilot while sitting and enjoying the scenery and fresh air, Molded fiberglass seats provide comfortable perches for the skipper and crew, and there is ample stowage in every available recess and hollow -including a two-bottle propane locker, A huge deck box just aft ingeniously incorporates air return plenums for the HVAC system, but also provides substantial stowage for miscellaneous deck gear, The top of the deck box doubles as a sun lounge, with room for two air mattresses or sleeping pads and a pair of built-in beverage holders, Sleep topside under the moon and stars during the beautiful summer months, Among the large inventory of extra safety gear aboard Maverick is a six-person offshore life raft, also stowed in the deck box, A tall mast is an ideal fixture upon which is mounted VHF Antanaes, Radar Reflectors, Radar and exterior lighting, The sturdy boom enables launching or retrieving the 10-foot Avon RIB shore boat with 9-horsepower outboard from either port or starboard, Anchoring is easy with a remote digital chain counter and electric windlass, double self-tailing anchor roller and deck wash down pump, She draws 7.5 feet, so she can get in just about any harbor. Anchor off any island and cruise into shore in the 10ft Avon Inflatable. Due to the glistening brass grab rails, reo-stated track and recessed lights and the delightful interaction of finely crafted high gloss varnished Red Oak and Purple Heart wood throughout a warm, elegant and classy feeling is apparent when you step inside Maverick, The initial impression conveyed by the bright, cheerful, yet distinguished interior choices is one of warmth, comfort and luxury, The boat is paneled throughout with carefully matched solid Red Oak and trimmed extensively with Purple Heart, The custom crafted joinery is precisely fit with decorative inlays used extensively, yet tastefully, throughout, Most cabinet doors are wood caned to keep airflow at a maximum, The interior of Maverick is noteworthy from both seen and unseen perspectives, What separates the interior of Maverick from other spectacular examples of custom marine woodworking is that throughout the vessel a variety of panels and fixtures can be removed to create exceptional service access, Wherever possible, shelves behind locker doors are on extension rollers to permit greater utility, When panels or fixtures are removed, the workmanship and systems thus exposed conform to some extremely high standards, Wires are exactly routed, parts and pieces are labeled and nearly everything is easy to reach for service or repair. The aft stateroom features a bunk on a pull-out extension, allowing it to be made up as either a single or a double berth, There is a gigantic under bunk storage area complete with huge deep drawers, There is also a corner cabinet and a hanging locker with a drawer and storage under the drawer. There is a standalone home sized shower, sink, and Vacuflush head accessible from either the main salon or aft stateroom, and below decks for the main stateroom, another Vacuflush head, sink, and vanity. The forward cabin on the main deck includes a spacious well-equipped gourmet galley that is substantially larger than one would expect to find aboard a 49-foot boat, In fact, the galley is as large as the kitchen would be in a medium sized home ashore, Most of the cooking is done with a Force 10 four-burner propane cooktop and oven, but there is a built-in microwave as well, The galley also boasts a large industrial size sink and an amazing number of large securable cabinets and drawers, Most of the galley is on the starboard side of the main cabin, but the cold storage locker is across the companionway to port, A Glacier Bay cold plate system operates a 12 cubic foot refrigerator and an equally large freezer. A four-person settee is to port, just forward of the cold storage locker, The raised floor under the settee is covered with solid Red Oak top nail laid in a specific and attractive pattern and a feature strip of inlaid Purple Heart, As an unexpected surprise, as well as an example of the possibilities available with custom joinery, the settee table is planked and inlaid with exactly the same pattern as the raised floor below. Interior panels are easily removable for service access, and the workmanship revealed is impeccable, There are 81+ storage locations on Maverick including bins, slide out drawers, closets and lockers! The pilothouse is most forward in the main cabin and features a fabulous array of electronics and controls, Key equipment is duplicated for safety, There are comfortable Captain and 1st Mate built in seats and a built in stowable foot rest, The upgraded engine monitoring gauges and a host of radars, plotters, radios and autopilot controls and the touch screen control for the TRAC stabilizers provide plenty of safety and operational options, without becoming an unworkable clutter around the wheel. Companionway stairs in the starboard forequarter of the main cabin curve easily down to the lower deck, In a forward area previously occupied by V-berths, the current owners have created a splendid office area with a built-in desk, cabinets, and book shelves complete with an ICOM 710 Single Side Band Radio! Aft of the office is the master suite, with a near king-size berth to port and a fabulously conceived and built wardrobe stowage system to starboard, A locker in the middle of the wardrobe has pocket doors, creating a natural place to install a TV set, The ensuite head has a Vacuflush, vanity, medicine cabinet, and lots of storage, The door to the engine room, with the same 6' 6" headroom enjoyed elsewhere on the lower deck, is in the aft bulkhead of the master stateroom. Imagine the way one might expect an airline pilot to maintain engines, and then imagine engines kept even cleaner still, That mental picture just might approach the spotless condition of the stand-up engine room aboard Maverick, The engines are twin white-painted 120-horsepower Ford Lehman diesels, which provide a stated cruise speed of 7-knots and a stated top speed of 8-knots, The current owner points out that "Lehman's aren't usually painted this color, but I had these painted white so that I could immediately see if there was anything leaking or seeping anywhere," There hasn't been a fire aboard Maverick, and it is unlikely that one would ever break out in the engine room or the lazarette immediately beyond: 45 pounds of halon in nine bottles are strategically positioned for use in case of emergency, Each engine is fit with a 130-amp alternator and operated by single lever Kobelt controls, Borg Warner Velvet Drive transmissions turn 28-inch, four-blade props, The tanks are FRP, the dripless shaft seals are carbon fiber and stainless steel, all through hulls are bronze (with emergency plugs located at every opening), and there is a fantastic built-in fuel polishing system, If the engines ever need to be removed, dedicated hatches in the deck overhead and the boat deck will allow them to be hauled out of the boat with a crane, No massive interior disassembly required. An 8kW Northern Lights generator supplies AC current underway, and a 7.5 KVA isolation transformer ensures a stable supply of shorepower from either 120 or 240 volt hookups, On the starboard side of the master stateroom is a wardrobe and TV Locker. For independent living there is a 1000 gallon a day Village MarineTec Watermaker, the ProHeat heating system uses diesel and an 8KW Northern Lights Generator. A Captains dream, Maverick was thoughtfully built so that everything that might need maintenance can be accessed with removable hatches or panels, Even the engines and transmissions can be lifted directly up and out of the boat through two hatches. Maverick is a Nationally Registered boat with an endorsement for Charter up to 6 people. The new owner could use Maverick as a B&B and Charter boat. Maverick is truly one of a kind: a commercial-duty hull transformed into the well-mannered fulfillment of a personal dream, The commercial pilot and his wife have created an admirable craft that reflects their unique lifestyle and values, She's unusual enough that she may not appeal to everybody, but somewhere there's a boater who will recognize her beauty, It's a luster that goes well beyond her stunning, hand crafted interior and thoughtful design, She is notable for her disciplined adherence to some extremely high standards. The owners have decided their next adventure will involve crossing oceans on a catamaran sailboat - in order to realize that dream, they must sell Maverick first! You will get many times the value of your money with one of a kind Maverick, The owners spared no expense or quality as they envisioned they would be on board for life, Unfortunately, due to extenuating circumstances, the boat must sell and is being offered at the incredible price of $259,000. For more information cut and paste this link into your web browser and visit: http://www.shipshapesystems.com/MaverickForSale.html PRICE SLASHED $36,000 TO $259,000!